And you thought Cookies and Cream was just for ice cream. This flavor was initially known as "the King Kong" of ice cream because as soon as it was introduced to the public, it was a success. 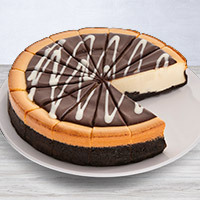 Who actually invented this stellar flavor is unknown (many desire the title) but what is known is that by 1983, cookies and cream became one of the 5 best selling flavors of ice cream. And it's not just great in America. Over 50% of the residents in Stuttgart, Germany voted for Cookies and Cream just ahead of classic Pistachio ice cream. 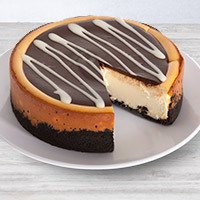 Needless to say, Cookies and Cream rocks and we've used it to create elegant cheesecakes that are quickly becoming best sellers for us, too.